Close Encounter of the First Kind - Sighting of a UFO. Close Encounter of the Second Kind - Physical Evidence. Close Encounter of the Third Kind - Contact. WE ARE NOT ALONE. Close Encounters of the Third Kind: The Ultimate Edition is visionary director Steven Spielberg's definitive director's cut of his exhilarating film. This new edition of his masterpiece is digitally remastered from newly-restored film elements and includes a "making of" featurette, complete with new behind-the-scenes footage and interviews with stars and crew. In the night skies near his Muncie, Indiana home, power repairman Roy Neary (Richard Dreyfuss) experiences something out of this world. His close encounter sets into action an amazing chain of events that leads to contact with the benevolent aliens and their Mothership. Spectacular special effects, John Williams' outstanding score and winning performances from Dreyfuss, Teri Garr, Melinda Dillon and legendary director Francois Truffaut in the role of Lacombe makes Close Encounters of the Third Kind: The Ultimate Edition movie magic of the best kind. $5.379 million on 272 screens. Original Theatrical Version: 135 min. In an odd way, Close Encounters of the Third Kind had a profound effect on my life. That’s because the movie’s existence indirectly led to my relationship with my long-time best friend Kevin. Although Kevin and I had known each other since he moved to our area in the summer of 1975, we’d never been friends. Kevin joined the Cub Scout “den” my Mom started at that time, so we hung out together to some degree, but no friendship formed until the winter of 1977. While we were in fifth grade, Kevin and another classmate produced a couple of issues of Splash Magazine, a Xeroxed effort with some cute little articles and other bits and pieces. Frankly, I don’t recall much about the content of Splash, but it seemed cool to the rest of us. When it came time to produce the third issue of Splash, Close Encounters of the Third Kind was the hot movie, so Kevin and Jeff wanted to do a “cover story” about it. Since I happened to own the paperback novelization of the story, I volunteered to draw a copy of the movie’s poster art for the cover of the magazine. Thus my closer relationship with Kevin was born, and although we never did produce that third issue of Splash, we’ve been friends ever since. As with virtually any relationship, Kevin and I have endured some rocky moments over the past 30-plus years, and I’ve also had my ups and downs with Close Encounters itself. I loved the movie at the time of its release, as did all of the kids. With both Star Wars and CE3K, 1977 was a killer year for science fiction, and we were happy to digest all of it. At its heart, CE3K is a simple fantasy that depicts the first formal meeting of humans and aliens. 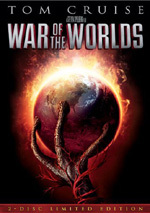 Although the film certainly features the global point of view and shows how governments might respond to this event, Spielberg wisely took the more intimate approach to tell the story. Roy Neary (Richard Dreyfuss) works as a technician for an Indiana power company and lives with his wife Ronnie (Teri Garr) and three kids. He seems like a nice enough guy, but clearly the bloom is off the rose and he’s living a fairly drab existence. All of that changes when some force causes electricity to cut off all across his area. After he’s sent to work on the situation, he comes quite close to some alien vehicles, and the experience leaves him changed, to say the least. From then on, he feels a nagging urge to find meaning in odd shapes, a desire that eventually leads him to apparent semi-madness. However, that’s not the case, and before too long Neary and others - including Jillian Guiler (Melinda Dillon), whose son Barry (Cary Guffey) has been kidnapped by the aliens - figure out what it is they need to do, and he heads out west for… well, he’s not sure what. Nor are we, but it’s a terrific ride as Roy and Jillian have to evade oppressive government forces to reach their ultimate goal. Close Encounters was Spielberg’s first film after the enormous success of 1975’s Jaws, and it represents a more personal project. While he clearly made Jaws his movie, he still functioned as a “hired hand” for the flick. He could take some liberties with the tale, but since the book had been so successful in its own right, there was only so much he could do to give Jaws his own stamp. No similar restrictions existed for CE3K which was his baby from the start. While earlier flicks such as Jaws displayed what would become some of Spielberg’s signature stylistic choices, CE3K was really the first time we saw the whole package. Spielberg has absorbed an awful lot of abuse over the years from those who think he’s a populist hack, but I think these critics are being excessively harsh. Sure, Spielberg can produce some sappy pap - Hook comes to mind, and Amistad was another dud - and I must admit that his best days seem to be behind him. Is CE3K a flawless movie? No, it has its own problems at times. For example, I always thought the aggressive way in which the aliens came to get Barry seemed to be at odds with their apparently-gentle nature; the abduction makes sense within the tone of the movie because it adds excitement and intrigue, but it didn’t really seem logical to me. Nonetheless, the film functions at a consistently high level from start to finish and offers an extremely well-executed fantasy. The acting is top-notch from Dreyfuss down the line. Through movies like Jaws and The Goodbye Girl - another 1977 offering, and one for which he earned an Academy Award - Dreyfuss became moderately pigeonholed as a sarcastic, self-centered sort of character. CE3K showed that he could easily portray other roles, and he brings off the middle-class dreamer in Neary nicely. Spielberg paced the film well, and though the effects have aged, they still hold up after almost a quarter of a century. It achieves a level of beauty and tenderness rare in the genre, and it also combines well-integrated humor, drama and action. As a whole, Close Encounters of the Third Kind remains a fabulous piece of work that deserves to be included along with the greatest films ever made. Close Encounters of the Third Kind appears in an aspect ratio of approximately 2.35:1 on this Blu-ray Disc. Very few concerns emerged during this terrific transfer. Sharpness usually seemed to be excellent. A few wide shots and interiors presented some softness, but that was about it, and those tended to occur either due to effects or depth of field issues. The vast majority of the flick offered strong delineation and clarity. No issues with jagged edges or shimmering occurred, and I noticed no signs of edge enhancement. I also found no source flaws. The source material could be grainy at times, but no artificial defects appeared. The grain actually seemed less distracting than I expected; CE3K is known as a grainy film, but I didn’t have any concerns about it presence at all. Colors looked fairly natural and distinct. The film didn’t feature a particular bright palette except for the hues generated by the alien crafts themselves, and I felt these tones appeared clear and vivid. Black levels occasionally looked a little too pale, but they usually appeared appropriately deep and dense, and shadow detail seemed clean and nicely heavy without excessive opacity. The smattering of slightly soft shots created my only minor complaints here, and they weren’t enough to knock my grade below a “B+“. I felt pleased with this transfer, as it often looked absolutely exceptional. The soundtracks of Close Encounters also displayed some minor problems but they nonetheless worked well for a film of this vintage. CE3K offered both Dolby Digital TrueHD 5.1 and DTS-HD MA 5.1 soundtracks. To my ears, they were very similar, so I didn’t give the nod to one or the other. The track featured a surprisingly broad and engaging soundfield. The front speakers offered a nice sense of ambience; in addition to John Williams’ score, they added a great deal of unique effects, all of which seemed to be well placed within the environment. The elements also blended together neatly and smoothly. Some directional dialogue occurred, and while it could seem somewhat tentative at times, for the most part I felt that the speech appeared to come from the appropriate locations. Surround usage generally sounded to be monaural, but a few instances of stereo usage clearly appeared; for instance, during a few scenes when alien ships zoomed past us, the audio provided unique information for the left and right rear channels. Otherwise, I thought that the surrounds contributed very solid reinforcement for the track. They didn’t seem to present a great deal of sound that was clearly specific to them, but they strongly bolstered the atmosphere throughout the movie. From the opening desert sandstorm scene to the ending with the Mothership, the rear speakers were fairly active participants that made this soundtrack quite compelling. Audio quality was more erratic, and dialogue presented the most problems. While speech always seemed to be intelligible, I thought that some minor edginess affected the experience. Most lines appeared acceptably natural, but some came across as a bit brittle and rough. Effects also showed some thinness and lacked tremendously natural qualities, though they matched up fine with most audio of the era; without re-recorded stems, this was about as good as the effects were likely to sound. Happily, they boasted some tremendous low-end at times. When the plane engines fired up during the opening desert sequence, the subwoofer kicked in with solid bass, and quite a few other scenes contributed excellent depth as well; as Roy experienced his first “close encounter”, I thought the hum of the ship was going to crack my foundation! John Williams’ score also presented nice dynamics, and the music appeared to be bright and vivid throughout the movie. Some hiss accompanied the track, and this defect seemed connected to the music; it only cropped up when the score became more prominent. However, the hiss was modest and didn’t create a terrible distraction. Frankly, I really liked the soundtrack of CE3K; were it not for some of the edginess to speech and the thinness of the effects, it would have easily made it to “A” territory. As it stands, I felt it earned a solid “B+”. How did the picture and audio of this Blu-ray compare to those of the 30th Anniversary DVD from 2007? Both demonstrated improvements, though these were less noticeable in the auditory domain. The two lossless tracks were a bit more dynamic than their predecessors, but not to a remarkable degree. The material still came from 30-plus-year-old roots, so there was only so much improvement to be found. On the other hand, I felt extremely impressed by the visuals. The 2007 DVD looked very good but really couldn’t hold a candle to the Blu-ray. I’ve seen CE3K countless times over the decades, but I’ve never seen it look remotely this good. I thought I knew how the film could look, but I didn’t believe it could be this clear and precise. The Blu-ray contains all of the same extras as the 2007 DVD plus some that it lacked. One of this package’s selling points comes from the fact that it includes all three versions of the film. These all appear on Disc One of this Blu-Ray set. The two-cent history here: due to a variety of pressures, Spielberg felt the 1977 theatrical release didn’t completely fulfill his vision of CE3K. Columbia gave him the money to do some reshoots for the SE with one caveat: he had to show viewers the interior of the Mothership at the film’s end. Although this edition added new footage, it was a shorter film due to some judicious editing on the part of Spielberg; he cut 16 minutes of shots from the original, reinstated seven minutes of material filmed in 1977 but not used, and added six minutes of newly-made material. The latter entries included the most controversial one: scenes from inside the Mothership at the end of the film. To get funding for the reshoot, Columbia wanted Spielberg to add these segments. As such, the SE of CE3K was a rather different film than the one originally seen in 1977. Spielberg reworked the movie again in 1998. This 137-minute “Director’s Cut” combines different aspects of the 1977 and 1980 versions. Many think this is the best edition of the movie, and I might agree, but some good bits from the 1977 film fail to appear. The introduction to the Nearys uses the scene from the 1980 cut, which is more abrupt but it adds some nice exposition to the family, so it’s a draw. Other 1980 snippets are integrated, such as “Roy’s shower” and the expedition to the Gobi Desert. The 1998 version cuts some segments that appeared in both the 1977 and 1980 versions, and these are the least positive changes. We lose the cool scene in which Roy looks at a pillowcase and states, “That’s not right”. We also don’t get some shots of Roy at the power plant; I liked these, but I can’t say they’re as painful to lose as the pillowcase. The alterations don’t hurt the movie terribly, but I wish Spielberg had kept these scenes in the movie. When I consider the three versions, I find it hard to choose between the theatrical edition and the Director’s Cut. I strongly dislike the Special Edition. Its additions and changes mostly hurt the film, especially in terms of the horrible “inside the Mothership” ending. Never say never, I suppose, but I seriously doubt I’ll ever want to revisit the SE. It’s a much closer call between the 1977 and 1998 versions. Actually, for a while, I preferred the Director’s Cut, primarily because I liked the Gobi Desert scene, maybe the only SE addition that worked for me. However, the more I see that shot, the less I like it. Now it feels redundant to me, and it doesn’t advance the plot. In addition, the fact that we get Lacombe’s sidekicks but no Lacombe makes it sound out as unnatural; Claude’s absence creates a distraction that almost takes me out of the movie. The beauty of this “30th Anniversary Ultimate Edition” is that it allows us to have the choice of the different versions. I might prefer the 1977 theatrical rendition, but others who like the 1980 or 1998 cuts can have their faves as well. It’s a great way to allow us flexibility. In addition to all three versions of the film, Disc One includes View from Above. It offers an on-screen guide to the variations found in the different versions. For the SE and DC, icons tell you if a shot/scene failed to appear in the 1977 edition and if a scene appears in the 1977 cut alone. 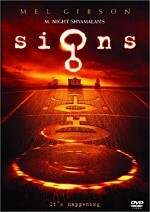 For the 1977 edition, an icon relates that something is unique to it. This is a nice way to get a representation of the variations. With that we head to Disc Two and the bulk of the supplements. 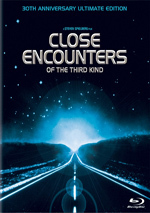 Most substantial of the bunch is The Making of Close Encounters of the Third Kind, a 1998 documentary. This one-hour, 41-minute, 48-second program combines film clips, excellent shots from the set, and a slew of contemporary (circa 1997) interviews with participants. In addition to writer/director Steven Spielberg, we hear from actors Richard Dreyfuss, Melinda Dillon, Teri Garr, Bob Balaban, and Cary Guffey, composer John Williams, director of photography Vilmos Zsigmond, editor Michael Kahn, production designer Joe Alves, animation supervisor Robert Swarthe, chief model maker Gregory Jein, production illustrator Ralph McQuarrie, special photographic effects person Douglas Trumbull, and Mothership photographer Dennis Muren. That’s a high-powered crew and their discussions added a lot of depth to my knowledge of the film. Not surprisingly, Spielberg dominates the proceedings. Filmed from the set of Saving Private Ryan, he contributes lots of solid details about the project’s genesis and its production, though at times I’m not terribly sure how well we can trust his memory. I also own the Criterion laserdisc CE3K set, and Spielberg alters some of the stories he told on that older set. None of the changes are major, but they exist; for example, when he discusses the ways in which he got little Cary Guffey to perform in the necessary manner, some of the details have changed. Nonetheless, the overall intent remained intact, so I don’t have too many concerns about Steve’s memory. As for the rest of the crew, they chime in quite frequently and add a tremendous amount of solid information about the movie. It’s a fine mix of technical and creative, and the overall arc of the production is related in a succinct and entertaining manner. The many outtakes and behind the scenes shots are also delightful; I especially enjoyed the alien test footage images. Put simply, this was an outstanding documentary that should be thoroughly compelling for fans of the film. Watch the Skies is a five-minute and 55-second featurette that came out at the same time as CE3K itself. This is truly a promotional piece that acts as a variation on the disc’s “Original Theatrical Preview”, albeit a more interesting one. It shows some decent shots from the set and also includes a brief comment from producer Julia Phillips. It remains an advertisement, but it’s a moderately enjoyable one. For something newer, we get Steven Spielberg: 30 Years of Close Encounters. 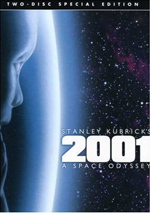 In this 21-minute and 22-second piece, we find a modern interview with Spielberg as he discusses the development of the story and the production, his thoughts about UFOs and research for the film, cast and performances, visual elements, sets and locations, how CE3K impacted his later flicks, editing, music, studio pressures and the flick’s release, the 1980 and 1998 versions, and some general thoughts. “Years” acts as a good complement to the longer documentary. It mostly touches on subjects not addressed there, so it becomes a fresh experience. Spielberg includes quite a few good stories; I especially like his observation that CE3K was a tough shoot but it seemed easy compared to the horrors of Jaws. I’d like a little more of a retrospective view of CE3K and what it meant to him, but this remains an informative piece. Nine Deleted Scenes appear. These run a total of 19 minutes, 20 seconds and provide a nice collection of cut sequences. Nothing particularly revelatory can be found, but all the clips are great to see for big fans. They’re a good addition to the Blu-ray; for reasons unknown, they don’t appear on the 2007 DVD, even though they were part of the 2001 release. Plenty more material shows up via “Explorations”. This divides into nine areas. Storyboard Comparison lets us examine drawings and final film for five sequences; all together, they fill a total of 22 minutes, 36 seconds. We also find Storyboard Galleries for “End Sequence 1” (79 frames) and “End Sequence 2” (123). All of these are compelling, though I especially like “End Sequence 2” since it displays high quality art; instead of the standard cartoony boards, it boasts color paintings. More stills show up elsewhere. Location Scouting Pictures (53) shows spots considered for the movie’s finale, while Mothership Drawings by Ralph McQuarrie (14) gives us a glimpse of design art. Behind the Scenes (277 across 16 areas) shows photos from the set, with an emphasis on Spielberg. Production Team (32 across five sections) opens things up to pics of Vilmos Szigmond, Joe Alves, Doug Trumbull, Michael Kahn and John Williams as well. Portrait Gallery (54 across eight segments) shows more of Spielberg, Hynek and the cast, while Marketing: Original Theatrical Release (177 across four) delivers posters, trading cards and lobby cards. Lastly, Special Edition (33 over two) follows similar lines. All are good, though I was startled to notice that the trading cards never showed Richard Dreyfus; I guess he refused to license his likeness. Note that the “Explorations” are exclusive to the Blu-ray – sort of. These components originally appeared in the 1998 laserdisc set, but they failed to make the 2001 or 2007 DVDs. Under Trailers, we find three promos: “Original Version”, “Special Edition” and “Ultimate Edition”. At six minutes, the “Original Version” is the most interesting, though even it isn’t particular fascinating. A few paper materials flesh out the set. A double-sided poster features the movie’s original theatrical art on one side and a comparison between the three cuts of the film on the other. I like that chart as a good reference point. We also find a 64-page Collector’s Book. It gathers many photos from the production as well as biographies on some cast and crewmembers and some notes from Spielberg. It’s a nice piece that adds value to the set. The “30th Anniversary Ultimate Edition” of Close Encounters of the Third Kind is a solid set, and the movie itself remains a classic, as Spielberg tells an enchanting story of our first formal meeting with aliens. He utilizes a first-person point of view that makes the tale accessible and moving, and the entire project is fulfilled with beauty and style. The Blu-ray provides very good visuals, audio and extras. Without question, this Blu-ray acts as the best representation of CE3K ever to hit the market, and it earns my strong recommendation.